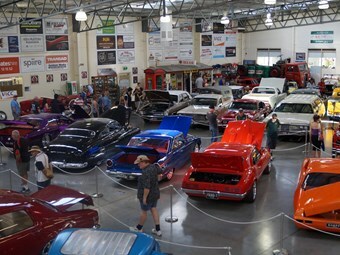 The Shepparton Motor Museum puts on some great shows. The Shepparton Motor Museum in Vic has partnered with Lloyds Auctions from Qld to hold a classic car auction at the Shepparton site. Known for its regularly-changing shows, the museum says it hopes the auction on April 29 will turn out to be a very welcome fund-raiser. In a recent announcement it said: "The Shepparton Motor Museum & Collectibles is excited to announce our inaugural Shepp Classic Auction event. "In conjunction with Lloyd’s Auctions, Shepparton Motor Museum & Collectibles will be conducting an amazing event that will gain national and international awareness of our fantastic museum and also raise much needed funds to help us grow. "If you or anyone you know would like your car or collection included in the auction please call Graeme Balfour on (03) 5823 5833 for further details." Lloyds next classic car auction is this Saturday, March 22. Camaro: Better Late Than Never?